Rainy Day Writer: Atom vs. 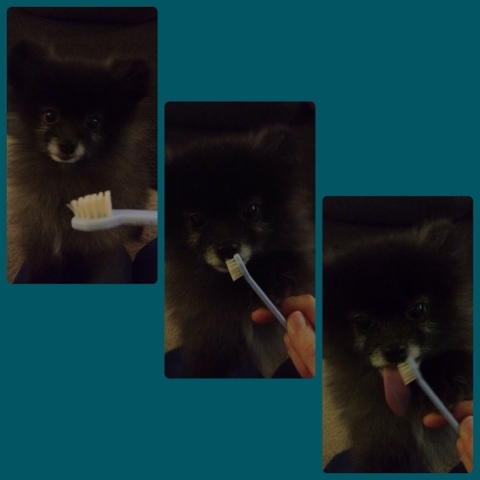 The Toothbrush: A Tiny Dog That Loves Oral Hygiene! Atom vs. The Toothbrush: A Tiny Dog That Loves Oral Hygiene! I thought I'd take a break from the jaw surgery posts for a second and talk about my Atom! Atom is my smallest dog. 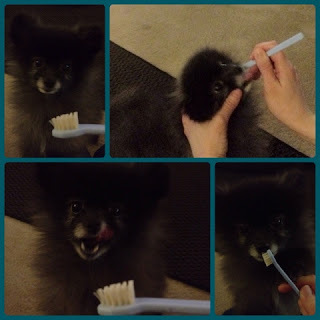 He's a 4-year-old Pomeranian, but contrary to what I initially believed, he is all black (well, mostly black with a little white on his nose and paws). I had thought all Pomeranians were orange. Unlike the other dogs, Atom doesn't really ask or beg for people food... unless it's vegetables! Seriously... a dog that loves vegetables.... His favorites are red bell peppers, crunchy lettuce, cucumbers (with seeds removed), carrots (if chopped real small), and he likes watermelon too -- watermelon isn't a vegetable, but it's on his list of favorites. Funny thing is, with red bell peppers Atom is especially picky. I can give him other colors, like orange or yellow, but he will take a few minutes to inspect them and look at me before deciding to eat them. 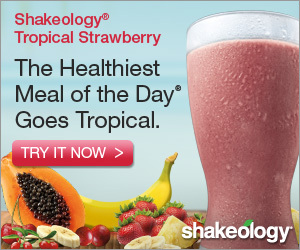 He KNOWS the difference! Atom LOVES his red bell peppers! 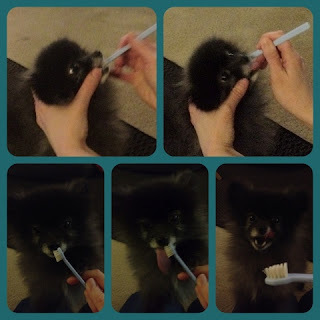 At night, after I brush my teeth, I brush Atom's teeth -- with his own toothbrush and special doggy-safe toothpaste, of course! Since having braces, brushing my teeth at night takes a bit longer. It doesn't have to, but I like to make sure I'm cleaning all the food and tartar out of my teeth, plus rinsing with mouth wash, etc. And since having surgery, this process takes even longer. I hold his head gently to help guide the toothbrush, and to prevent hurting him since he likes to move around a lot. 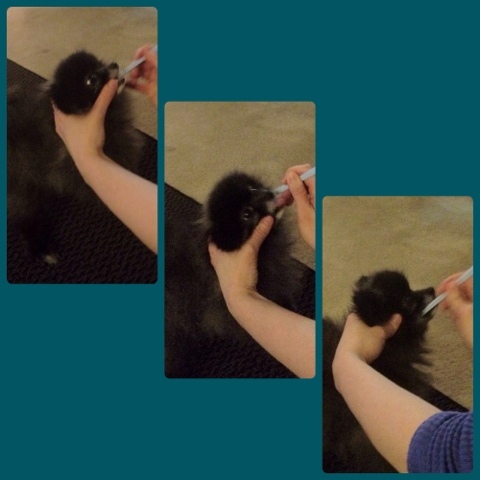 It also allows me to use my left thumb to help keep him from biting down on the toothbrush. Did we get them all? How many teeth ARE in your tiny little head? !